But this post isn’t about patting myself on the back (although I’d be a HUGE liar if I said I wasn’t pleased as punch and very proud of receiving the award too) rather it’s a behind the scenes look at how I came to be asked to attend the dinner – which was to talk to guests about the beer and food pairings they were having on the night – and my role in selecting those matches. It, of course, started with a bloke I met down the pub. 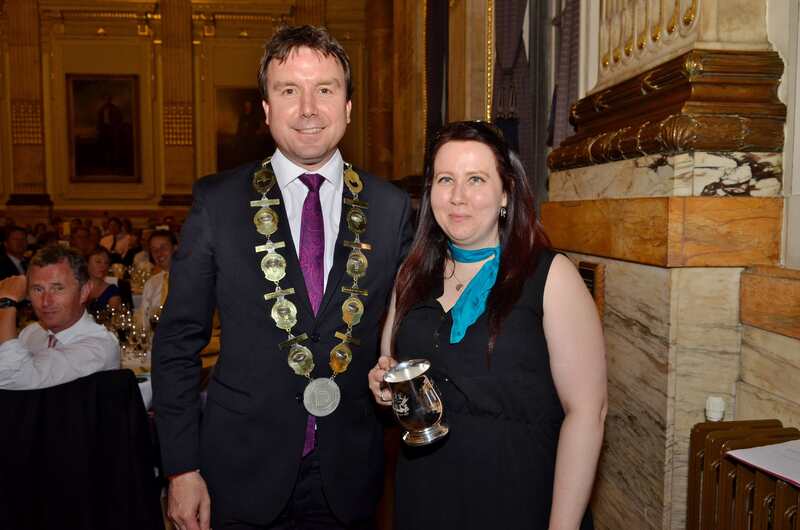 A chap who works with the Beer Academy; he got in touch to ask if I could speak about the beer and food matches at the annual APPG* beer dinner (keeping quiet that it was an awards bash). Of course I said yes and was duly also asked if I could also be involved in selecting the beers and choosing which went best with the planned menu. 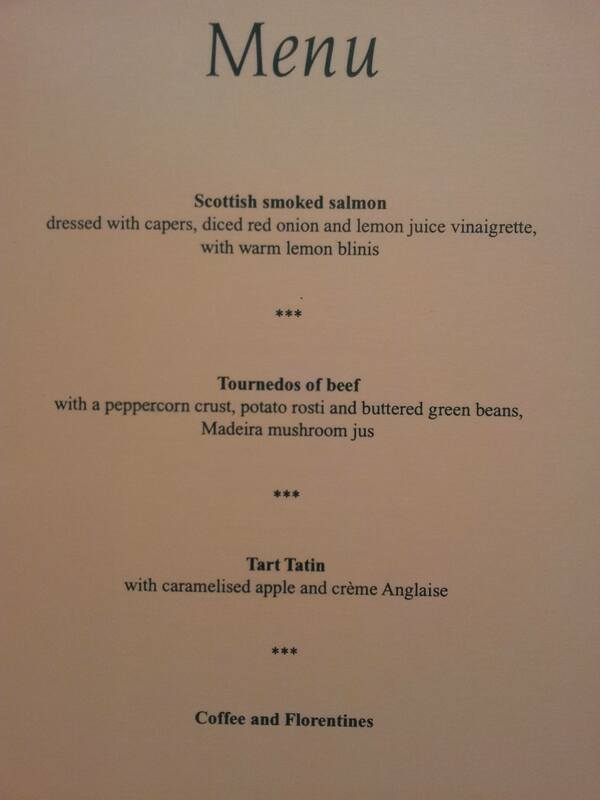 The menu: Smoked salmon, Beef and Tart Tatin.. The contenders – they DID have class. 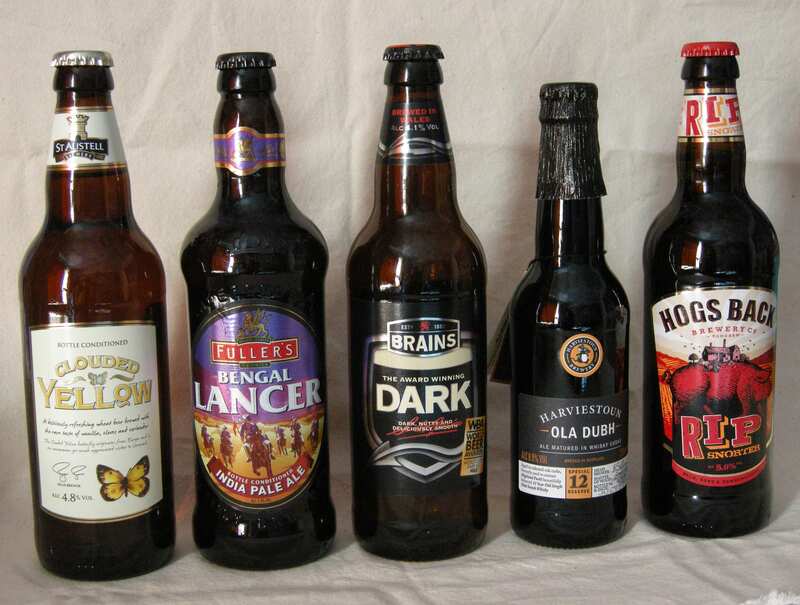 Opinion was canvassed from a variety of beer writers, beer sommeliers, members of the team who would prepare and serve the dinner and even a member of the House of Lords, Lord Kennedy of Southwark, who was more than a little impressed with Harviestoun’s Ola Dubh – among other beers. Suggestions were passed via email and samples of as many as the beers as possible were called in to be taste tested with the food. This would be a book if I went through the pairings we tried out one by one. Instead here are the edited highlights. I was convinced we should try either a gueuze or a saison with the salmon first course but fellow sommelier Annabel Smith was spot on with her suggestion of St Austell Clouded Yellow (4.8%). We ditched the gueuze in the end but tried Bristol Beer Factory Saison (6.5% – fab but too bitter with the food), Sharp’s Cornish Pilsner (5.2% – good flavour match but too gassy, esp with a starter) and Adnam’s Sole Star (2.7% didn’t work with the salmon but definitely punches above its ABV in terms of flavour). 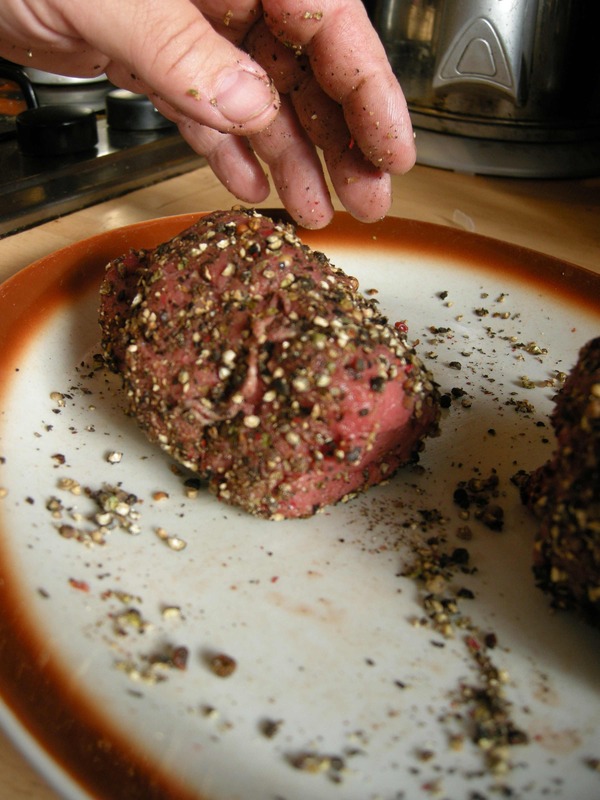 On to the main course a beef dish with a peppercorn crust. I’d had some success at a recent event of matching cold cuts of roast beef with Brains Dark (4.1%) so I was determined to give it a go with a hot beef dish. I also thought Moor Beer Amoor porter (4.7%) was worth a try but delicious though it is it didn’t work with this dish at all and its coffee flavours became almost overwhelming. Fullers ESB (5.9%) and Shepherd Neame’s IPA (6.2%) from its ‘retro’ series of beers both offered decent matches but neither really made a pairing that sang. Enter Fullers Bengal Lancer (5.2%), as suggested by Tim Hampson. I was utterly unconvinced by this match at first taste as the beef seemed to bring out a weird lemon toilet cleaner flavour in the beer – although I was apparently the only one to experience this. The Brains Dark sang to me though. Served quite cool it refreshed my palate and the beef really emphasised the chocolate flavours. We had quite a debate about this one and eventually opted to serve both the Bengal Lancer and the Dark. Dessert was a challenge. Basically a posh apple tart with custard it nevertheless contained a range of flavours to work with. I’d heard that others had successfully matched Innis & Gunn’s whiskey cask aged beers with apple pie but I find it hard to be impressed by any brewery that persists in putting its beer in clear glass bottles. I also wanted something that would contrast with the creaminess of the custard (or creme Anglaise as it actually was – lighter and not as thick as custard if the truth be told) so I suggested Harviestoun Ola Dubh 12 (8%) as presenting the best of both worlds. Many of the assembled food matching panellists were sceptical about this but I thought it worked cutting though the caramelised apples and creamy sauce with the latter bringing up the bitterness of the Ola Dubh in the manner of strong dark chocolate. We also chose Hogsback RIP Snorter (5%) as we thought the pronounced caramel and dried fruit flavours in the beer would compliment the apple – although to me the two didn’t do each other any favours. 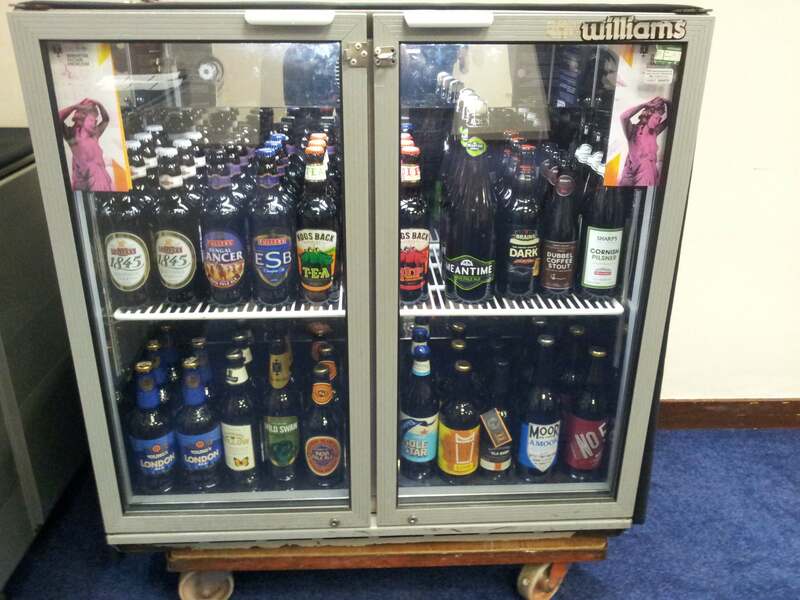 The beers that made it through the selection process! Because I was going to have to stand up in front of a couple of hundred people an explain why we were giving them these beers with this food I thought I’d better double check the pairings. 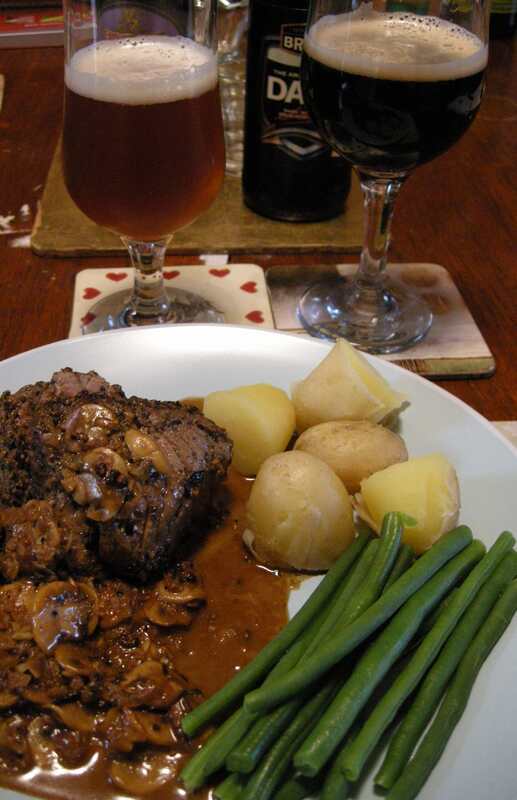 Not having access to the chef and team at One Great George Street (where the dinner was held) I drafted in Beer Husband to cook up a Tournedos of beef with a peppercorn crust so I could re-taste it with the beers. (See images below). 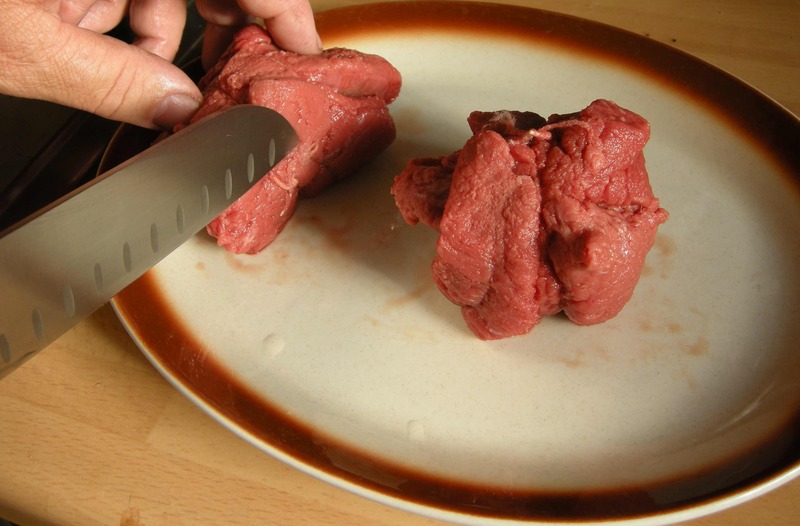 Time to eat the beef! (Here comes the flavour pantechnicon). Between talk of how the beef dish he’d created was a ‘flavour pantechnicon’ he and I both tested the matches. Despite being a big fan of Brains Dark Beer Husband much preferred the Bengal Lancer with the beef and felt it made the Dark taste like a milk stout – a style he is not keen on. I too preferred the Bengal Lancer as it doused the heat of the peppercorns and the beer tasted much fruitier and vibrant for it. I can only assume my previous toilet cleaner moment was an anomaly as the pairing brought out the best in beer and food. The Dark was transformed from mild to fruity stout (think plums and damsons) when I re-tasted and still sang. I also cobbled together a version of the smoked salmon starter by buying fish infused with lemon oil and herbs and eating it on top of a mini blini. This reinforced how well the carbonation of the Clouded Yellow cut through the salmon’s oiliness and the vanilla flavour in the beer creamily complimented the lemon flavour in the food. The food also brought up the beer’s herbal qualities. Beer Husband and I had eaten far too much at this stage to re-test the tart tatin but people seemed to enjoy the match on the night and we still have that re-tesing joy to come – Ola Dubh included. *Standard abbreviation for All Party Parliamentary Groups of all kinds. it’s interesting that beers from what you might describe as “the new wave” of brewing were too highly flavoured for food matches, whereas the trad breweries were more accommodating on the whole. That’s a good point Zak. I hadn’t really picked up on that. Perhaps it’s because it was quite a traditional menu so it called for traditional beers?